RAZOR LED TORCHESRAZOR 3AA-CELL LED FLASHLIGHT, standard product features Deep Dish Reflector focuses the light from the high output LED Ergonomic & Tactical Design Push Button Switch for easy accessibility Knurled Design allows for maximum grip & total control	Watertight Seal Constructed of Super Tough Nylon RAZOR IECE, standard product featuresHeld battery powered torch for use in Zone 0 temperature class T3 group IIC applications and Zone 20 group IIIB applications. 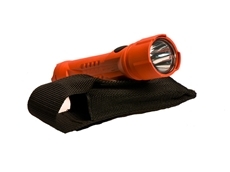 Powered by three LR6 cells and has a single LEDBody and tail cap manufactured from dissipative polypropylene that is black, orange & greenPermitted cell type is Duracell Coppertop MN1500WORKSAFE LED TORCHESLED2224 TORCH, standard product features Waterproof3-way switch (on-off-flash)Deep ribbed caseNon-slip gropFaceted reflectorLend ring accepts wandsCrush-resistant casePolycarbonate lens LED2217, standard product features For use in hazardous atmospheres‘S’ Biner included for quick attachmentWaterproof, IP67 rating‘SwitchGuard’Prevents accidental lighting Three-way switch:On-Momentary-OffAnti-rolltube LIGHTHAWK RECHARGEABLELIGHTHAWK VISION-600, standard product features Wall and Vehicle Mountable Microprocessor controlled Super Tough Nylon Construction LED charge Status Indicator Non-Slip rubber bottom and handle Low Battery Indicator High visibility flashing LED tail light LIGHTHAWKE LED GEN 11, standard product features Wall and vehicle mountable Dual mode main beamSuper tough nylon constructionLED charge status indicatorNon-slip rubber bottom and handle Low battery indicatorDual mode high visibility signal tail lightEasily adjustable articulated headQuick release shoulder strapLimited lifetime warrantyRESPONDER RA LEDALKALINE RESPONDER R/A LED, standard product features Division 1 safety approved Supports Alkaline or Li-Ion Battery Packs Impact Resistant to 1 Meter Ergonomically Designed Switch, for Ease ofOperation	Waterproof to 1 Meter Light weight (1 lb) Low Profile Design keeps it close to your body Unparalleled smoke penetration	RECHARGEABLE RESPONDER R/A LED, standard product features Division 1 safety approved First RA light utilizing Lithium-Ion T echnology Supports Alkaline or Li-Ion Battery Packs Impact Resistant to 1 Meter Ergonomically Designed Switch, for Ease of Operation Waterproof to 1 Meter 4 hour charge time Light weight (under 1lb) Battery Charge Indicator Low Profile Design keeps it close to your body Unparalleled smoke penetration. Emergency Light Feature: By placing Right Angle into charging cradle with switch pressed into on position, Right Angle will automatically turn on in the absence of power. 30/01/15 - Patents have been issued to Checkers Industrial Safety Products by the United States and Australia for its top-rated Gorilla all-purpose warning whips.A reputed manufacturer of cutting-edge safety products utilised in a variety of applications, Checkers is committed to constant improvement, resulting in patents being granted for its top-rated Gorilla range.Checkers President and CEO, Ray Torres explains that lighted warning whips have become a valuable, accident-reducing safety tool in mining and various industries. Conventional whips available in the market frequently short out when exposed to water. The re-engineered Gorilla safety whips were introduced in 2013 and are being seen as a game changer, proven by the recently issued utility and design patents.The redesign of Gorilla all-purpose warning whips included the development of a single, continuous power and ground connection from the installation point to the whip light. This connection drastically reduced the possibility of light failure due to electrical shorting, while a unique stainless steel hex base, water-resistant pig tail, and o-ring seal design improved water resistance. 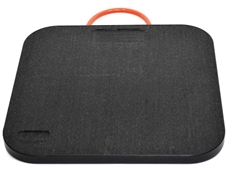 The premium fibreglass resin construction makes it the strongest whip in the industry.Patents issued to Checkers Industrial Safety Products for its Gorilla all-purpose whips include: Waterproof Warning Whip Hex Base and Connector (U.S. Utility Patent #8939635, Australian Design Patent #349732); LED Adaptable Whip Light (U.S. Patent Approved, Australian Design Patent #352914); and LED AP Permanent Whip Light (U.S. Patent Approved, Australian Design Patent #351911).Additional patents are approved and pending in both the United States and Canada.Checkers’ Gorilla all purpose warning whips are available in Australia from SM Safety (Special Mining Services). 08/09/14 - SM Safety (Special Mining Services) introduces a new range of LED flare kits from Checkers Industrial designed to enhance safety on the road.Currently used by law enforcement personnel, fire departments, construction workers, search and rescue teams, tow truckers, ground safety crews and many more, the LED flare kit provides additional visible warning lights and comes with six LED flares, a wall charger and car charger. The LED flares come in Blue, Amber and Red colours.The LED flare is made of durable aluminium alloy to provide a long life. With no switches and moving parts in the design, the LED flare avoids any risk of breakage or damage. 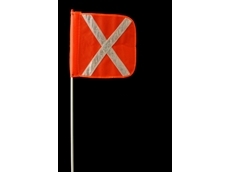 The weatherproof construction of the LED flare is also waterproof up to 15 feet. 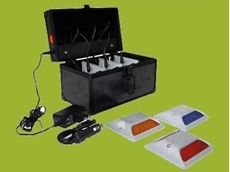 Additionally, the traction on the bottom of each LED flare kit helps prevent movement when a vehicle goes over it.Powered by a lithium battery that offers 6-8 hours of continuous use between charges, the LED flare can also operate on 110-240V power supply, and can be customised for different electrical outlet plugs in any country. The battery can be fully charged in 120 minutes.Key features of the LED flares include night-time visibility of 3,500 ft. (1,066m); 120 flashes per minute; crush resistance up to 20,000 lbs. (9071.8g); durable aluminium alloy housing; and waterproof up to 15 feet (4.57m).The LED flares are eco-friendly because they can be reused, replacing thousands of flares. Green features also include no perchlorate, eliminating ground water contamination; no toxic fumes released; and no residue or debris left behind. 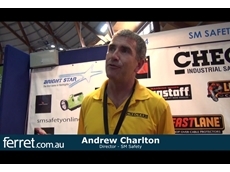 05/08/13 - In the video embedded below filmed live from the Sydney Safety Show 2012, SM Safety Director Andrew Charlton talks with Ferret.com.au about a number of new products the company has introduced to the Australian market. New to the Checkers range of Monster wheel chocks are models that are significantly lighter than previous iterations. In particular the new 14.5kg MC3011 wheel chocks are 24% lighter than the previous MC1911 model, while offering the same holding power. This reduction in weight makes the chocks easier to handle and significantly reduces the potential for worker injury. Being lighter, the chocks are also cheaper to ship and transport. The highly durable MC3011 wheel chocks are specifically designed for mine haul trucks with tyre sizes of up to 419.1cm in diameter and gross vehicle operating weights of up to 725,748kg. They also feature a weather resistant urethane construction with an outer shell that is designed to withstand high impact and is resistant to oils, fuels and solvents. Koehler-Bright Star specialists in rechargeable lights. The company’s latest development, available exclusively in Australia from SM Safety, is an intrinsically safe cordless LED caplamp that is described as one of the brightest on the market. The Koehler-Bright Star LI-6000 WHEAT LED cordless caplamp will run for 12 to 14 hours on a single five hour charge. It is MSHA approved and is designed to meet the most stringent lighting demands encountered in mine environments. 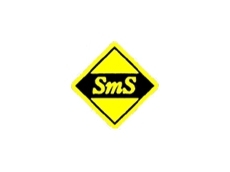 Andrew concludes the interview above by mentioning SM Safety’s range of polyurethane cable protectors. Suitable for electrical and delicate multimedia cables, the GUARD DOG range of low profile cable protectors is available in five channel options with standard ramps or with low angle ADA compliant ramps. 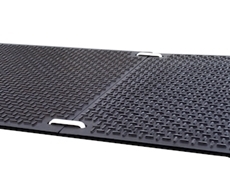 Standard ramps are available with our without anti-slip rubber pads. All cable protectors in the range are fitted with a carry handle recessed underneath and a hinged lid for easy cable placement. They also feature safety warning symbols moulded into the ramp’s lid, and offer a very high load capacity of at least 11.7 tonne axle load. 18/06/13 - Checkers Industrial Products has released the new 2013 Wheel Chock Reference Guide. Checkers’ 2013 Wheel Chock Reference Guide features the new lightweight MC3000 series of monster mining chocks. The reference guide allows correct selection of wheel chocks for the job by simply choosing the gross weight of the vehicle and the tyre diameter.For instance, for a CAT 793D with 3.6m tyres (40.00R57), one would use 2 x MC3012 @ 10.8kg each on standard terrain or 2 x MC3011 @ 14.5kg each on steep grades. Checkers Industrial wheel chocks deliver assured and lasting performance for all sizes of vehicles from utes and cars to large mine trucks such as the CAT 797 and Komatsu 960E SM Safety (Special Mining Services) is now stocking the full range of Checkers urethane wheel chocks in Australia including the new MC3000 series.